Our experienced team at APA works closely with the local electric utility companies to provide rebates to our customers on the purchase of new ABB drives to replace older, outdated VFD's in your facility. We can help facilitate the paperwork to ensure that our customers receive applicable rebates. 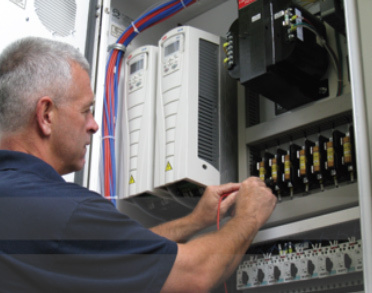 The service team at APA is experienced in performing on-site audits of your existing inventory of ABB VFD's, providing factory trained service technicians on site to advise on the most cost-effective remedy for worn or inoperable VFD's. We can also provide annual service contracts to have a technician proactively inspect your ABB drive inventory for proper operation and functionality. APA partners with all of the local MEP design firms involved with the new construction projects, and provides assistance in the selection of the appropriate ABB VFD for your specific application.